East West: Chance to WIN a fully licensed TERAPACK valued at $7,199! Chance to WIN a fully licensed TERAPACK valued at $7,199! EASTWEST invites you to „Like them on Facebook and be automatically entered into a sweepstakes for a fully licensed TERAPACK valued at $7,199. No purchase is required, and the winner will be chosen March 31, 2012. 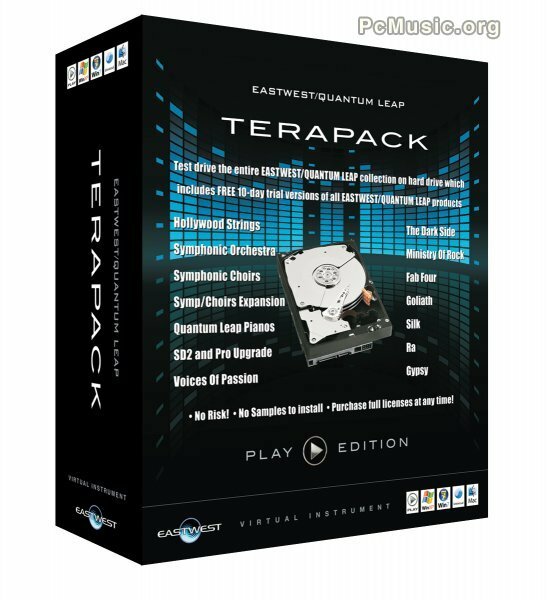 The TERAPACK includes EASTWEST/QUANTUM LEAP products Hollywood Strings Gold, Spaces Reverb, The Dark Side, Symphonic Orchestra, Symphonic Choirs, Symphonic Choirs Expansion, EastWest/Quantum Leap Pianos, Stormdrum 2 and SD2 Pro Upgrade, Voices of Passion, Ministry of Rock 1, Ministry of Rock 2, Fab Four, Goliath, Silk, Ra, and Gypsy. The TERAPACK is available for Mac and PC, is compatible with all major DAW platforms, and requires a separate iLok key (not included) for operation.